CIT Bank is a U.S. bank with over 100 years of history. It has approximately $50 billion in assets and more than $30 billion of deposits. It is ranked among the Fortune 1,000 largest American companies and is one of the largest banks in the United States. CIT is a public company listed on the New York Stock Exchange (stock ticker: CIT) with around $5 billion in market capital. 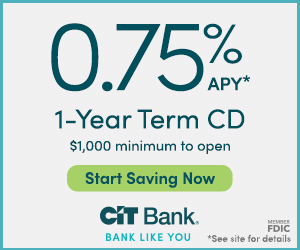 CIT Bank offers industry-leading interest rates for savings or CD (Certificate of Deposit) accounts. 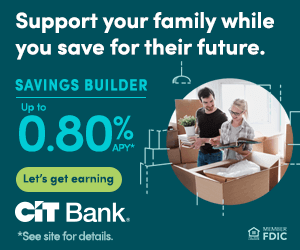 CIT Bank 2.45% Savings Builder Account has the best annual yield in the nation. You are eligible to receive 2.45% APY if you deposit $100 or more each month, or maintain an account balance of $25,000 or more. If you have a job, you can simply set up direct deposits of your paycheck funds to your CIT account to qualify for the 2.45% APY. You may also consider CIT Bank 2.05% No-Penalty CD, which allows you to lock in 2.05% interest for 11 months and withdraw funds with no penalty, as long as you keep the funds in the account for at least 7 days. 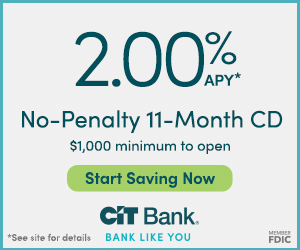 With a CIT Bank Savings Builder Account, you can earn a competitive interest rate and access your money easily. Open an account with $25,000 or more and earn 2.45% APY on your money - one of the top savings rates in the nation. If you don't have $25,000 in your account, you can still earn 2.45% APY by making at least one single deposit of $100 every month. Start with $100 per month and build your habit of savings - all while getting a top rate. It's an ideal online account for saving towards a new experience or a large purchase. Grow your savings faster than at your everyday bank for your first or next dream home. Open a Premier High Yield Savings account and get a 1.85% APY (on balances up to $250k).